I ran into James May reassembling a lawn mower. James, being his usual entertaining self made some comments about the history of the lawn mower, something rather surprisingly, I had never thought very much about. Before the lawn mower and right up until now actually lawns were cut by hand with a scythe or by using a herd of sheep which were very good at converting tall grass into grass fertilizer. With the onset of the industrial revolution an intrepid British inventor type came up with what would be the bane of my childhood, the reel type mower. We can see an intrepid Victorian gentleman in Connecticut using his mower here. In fact my childhood could, in many ways be a retelling of the history of lawnmowing as it was my responsibility to first cut the grass with a reel mower, then a power reel type and finally rotaries. Here’s a longer history of mowing. The first mechanical mower of which there is any record was patented in England in 1830 by a Mr. Edwin Budding of Stroud, Gloucestershire. This mower, which moved on a massive iron roller, featured a reel blade that worked against a parallel bedplate. The Budding mower introduced the still-popular principle of the reel-cutting blade. 1,500 of these were produced between 1833 and 1859. Successors to this company are still in business, under the name of Lawn Mower Works. The first power was added in 1842, when a Mr. Shanks of “Shanks’ Mare” fame patented a Budding-type horse-drawn mower, In 1859, the Silens Messer mower, which used chain drive instead of the Budding gear drive, was patented. In 1869, Follows and Bates, of Manchester, England, patented a side-wheel lawn mower, driven by internal teeth in the wheel that engaged pinions on the reel spindle. This machine was considerable lighter than previous roller types. The first line of reasonably moderate-priced mowers was brought out by the firm of Ransome, Sims and Jeffries, Ltd, in the 1860s. These mowers, which were of light construction, were produced in a number of sizes with varying features. In, 1878, the Pennsylvania Mower Company patented a side-wheel machine that was driven by a train of gearing instead of internal gear ring and pinion. The first gasoline-powered lawn mower was patented by Mr. Edward Ransome in 1902, while the first successful attempt to market a gasoline-powered mower was made by the Thomas Green firm in 1904. Following World War I, mass production and the general awakening of the American industrial giant brought forth a host of power-mower and hand-mower manufacturers. From1918 to 1925, millions of the familiar hand-push reel mowers were made by scores of manufacturers in the U.S. and abroad. By1925, however, the gasoline-powered reel mower began to take a bigger and bigger share of the market. For example: in 1924, 880,000 hand-push mowers, totaling $7,000,000, were sold in the U.S. In the same year, 5,000 reel-type power-mowers were sold for a total of$1,250,000. Toward the middle of the 1930s, the rotary power mower, featuring a horizontally-mounted cutting blade, began to appear on the American home scene. This was the first and most significant advance in a century of lawn mowing. Since World War II there have been great strides in the development of power mowers. The rotary has become increasingly popular: in 1958, approximately 90% of the power mowers sold were rotaries, either self-propelled or push-propelled. Lawn-Boy became the country’s first production-line manufacturer of complete power mowers, including engines, in the early 1950s, when Outboard Marine bought out the Roto Power Mower Company of Kansas City, Missouri, one of the very first rotary-power manufacturers. Power mower sales in 1971 exceeded 5,500,000 units. The walk-behind rotary accounted for 4,700,000, or 85% of all power mower sales, according to the Outdoor Power Equipment Institute. About 80% of the sales in 1971 were for the replacement of the 38,000,000 power mowers currently in use in the United States. Sales of rider mowers and lawn tractors have grown to over 800,000 units annually. Lawn-and-garden business is booming and will continue to boom. Saturation? It will help, not hurt, the quality manufacturer. Through the years, Lawn-Boy has continued to improve in design and performance- of Lawn-Boy products. This is one reason why Lawn-Boy is one of the world leaders in the industry. Lawn-Boy is one of the few manufacturers that offers a complete choice of models designed to fit all mowing requirements. From the apartment dweller to the estate owner, Lawn-Boy offers a choice to satisfy all lawn and garden requirements.Tests have shown the Lawn-Boy D-400 Series, 2-cycle engine, to be one of the best engines available. The heart of your mower is the engine, and the D-400 Series is designed to offer years of dependable service. 1972 — Lawn-Boy introduced its first solid state (CD) D-600 Series engine. Available with manual or electric start — self-propelled or push-propelled models. The solid state ignition system has no moving parts and, is completely enclosed, reducing ignition failure while producing up to 30,000 volts. With no points, coil, or condenser to replace, it offers longer sparkplug life. The all–new carburetor used on the D-600 Series engine is completely automatic. No adjustment, other than an atmospheric-pressure adjustment, is required. A new primer system forces compressed air into the float chamber, which forces fuel into the carburetor venturi. This method of priming is effective, and consequently, one prime is usually sufficient to start the engine. The larger muffler design reduces noise and exhaust down into the turf. Lawn-Boy developed the revolutionary CORDLESS ELECTRIC MOWER — Powered by 36 volts, this compact mower contains all the engineering “know-how” and safety features of gasoline-operated mowers. Excessive noise and exhaust fumes are eliminated. One more FIRST for Lawn-Boy. In the future, Lawn-Boy will continue to improve to offer you, the dealer, and your customers the best product available. The lawn mower Wikipedia page. Popular mechanics has a brief history of the lawn mower. In 1830 the first lawn mower was designed and patented by Edwin Beard Budding of Stroud, Gloucestershire. Until recently not much was known about Edwin Budding. He was born in the last quarter of 1795, the illegitimate son of a yeoman farmer, though having a good education. He started work as a carpenter but soon drifted into the iron foundries where there was a need for pattern makers. It was quickly found that Edwin Budding had a knack of solving engineering problems and he is known to have worked for more than one iron master. Between 1825 and 1830 he designed a Pepper Box pistol which was further advanced than Samuel Colt’s patent of 1836. In 1840, along with the Earl of Ducie and Richard Clyburn (the latter was the inventor of the threshing drum), he designed a machine for cutting vegetable substances. In 1843, along with George Lister of Dursley, he improved the carding machine the same machine from which he obtained his own idea to design the lawn mower. The improvements to the carding machine have never been altered, even in today’s machines. Budding also designed a shifting spanner and a lathe. In 1830, on designing the lawn mower, he went into partnership with John Ferrabee, owner of the Phoenix Iron Works and known for producing high quality engineering goods. The partnership concluded that Edwin Budding would solve any problems in the production while John Ferrabee took care of sales and legality of the patent licence. The first machine produced was 19in in width with a frame made of wrought iron. The mower was pushed from behind with the motive power coming from the rear land roller which drove gears to transfer the drive to the knives on the cutting cylinder; the ratio was 16:1. There was another roller placed in between the cutting cylinder and the land roller which was adjustable to alter the height of cut. On cutting, the grass clippings were hurled forward into a tray like box. It was soon realised, however, that an extra handle was needed in front of the machine which could be used to help pull it along. Two of the earliest Budding machines sold went to Regent’s Park Zoological Gardens in London and the Oxford Colleges. During the 1830s Ferrabee extended the range with 16in and 22in machines and by 1840 over 1,000 Budding mowers had been sold. Initially Ransomes were acting as wholesalers from their showroom in Bury St Edmunds but in 1837 they started to produce the machines under licence. An extract from George Biddell’s memoirs states: “It was during April in the year 1840 when I came to the foundry on probation. The principal work being done by the firm was fitting up Budding lawn mowers” (George Biddell later be came the first lawn mower manager for Ransomes). Unfortunately Edwin Beard Budding died of a stroke in 1846 at the age of 50 and, like so many inventors, did not see the full results of his design. W F Carnegie of Arbroath, Scotland, was another purchaser of a Budding lawn mower. Carnegie’s problem was that his lawns covered 2½ acres and the Budding machine was not up to the job. He engaged a local engineer, James Shanks, to set about making a machine of 27in width which could be pulled by two men or a pony. The latter was found to be best and when cutting was carried out in dry weather the pony left no traces on the grass. In 1842 James Shanks patented his design in Scotland. Up to 1852 Scotland had its own patent system so Budding’s patent only covered England and Wales. Nonetheless, Ferrabee travelled to Scotland in 1841 to check with Shanks to make sure there were no infringements. Shanks started lawn mower production in 1842 but the machines were designed by Mr Talbot, an employee of Shanks. His machine was of 48in width. By 1852 Ferrabee had made improvements to the original Budding design and added two more sizes, a 30in and a 36in machine. By now they had sold upwards of 4,000 machines. In their advertisements for 1852 they stated that only mowers marked Budding were guaranteed a suggestion of competition from a new source. In fact what happened was that the Patent Office had started to allow lawn mower improvements in design to be patented and this opened up the field to others. The first patented improvement was that of Samuel Boyd in 1854. The company which manufactured the machine were Samuelson of Banbury, agricultural implement makers. 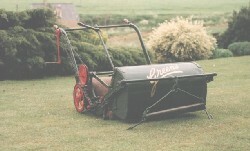 The mower designed was on the same principle as Budding except that it was lighter in draught and easier. In 1855 a new contender, Thomas Green of Leeds, entered the field of lawn mower manufacturers. Thomas Green was a blacksmith and maker of wrought iron gates who that year designed a machine which could be drawn from behind (in fact Shanks sold the same design in August 1856). Green made improvements on the Budding design by reducing its weight by one third and added a rake to lift the grass before it was cut. This mower was produced in a wide range of sizes from the smallest of 8in to the largest at 42in. A 48in model was tried but it was found that too much flex and wear on the gears made it impracticable. The first lawn mower trial took place in the London Horticultural Gardens at Chiswick in 1858. The trial area was at the side of the arboretum and plots were drawn of equal size. The entrants were Shanks, Ferrabee, Samuelson and Green. They all brought machines of 22in width, excepting for Green whose machine was a 24in model. Green’s machine was judged the best with Shanks and Ferrabee runners up. Samuelson was placed last, having received a poor write up because the gears kept clogging. That same year, after selling some 1,500 machines, Ransomes stopped producing the Budding mowers. Instead they became wholesalers for Thomas Green and Shanks. The following year Ferrabee’s son James took over the engineering works and made improvements to the Budding design. Thomas Green patented the first lawn mower to be driven by chains, a fundamental development because chain drive meant a lighter machine. He named this machine the Silens Messor which implies silent running. Although the Silens Messor range altered shape over the years the fundamental principles did not and the range was to become the backbone to Thomas Green’s business until production finally ended in 1935. In 1861 Ransomes re-entered the lawn mower market with their now improved machine. Although still resembling the Budding machine, it was shown at the International Exhibition of 1862 along with Shanks, Ferrabee and Green. In fact Green had an enormous stand at the exhibition and managed to win most of the medals on offer. The International Exhibition created interest from new companies who started to produce their own style of mowers. Morton’s Patent, by Grimmond Laird of Arbroath, Scotland, appeared in 1863 but was short-lived as there was no real improvement to that already on offer. From 1864 most manufacturers had left behind the predominant style of the Budding machine. The land rollers had reduced in diameter, the material for the castings had altered because by now most companies were using cast iron. Cast iron was found to be a vast improvement because, when molten, it could be poured into a cast, enabling the most intricate shapes to be produced. In 1864 Barnard, Bishop & Barnard invented a new style of drive whereby instead of a chain or gear drive, three rubber tyred wheels, of different diameters were used. As the mower was pushed along, the wheels turned by friction. This idea, however, was not successful and by 1866 a return to gear-drive had been made. Ransomes in 1867 introduced a totally new design of mower, the Automaton which became an instant success with over 1,000 machines being sold in the first season. This design was to put Ransomes level with the other two main producers, Shanks and Green. Follows and Bates entered the market in 1869 with a mower called the Climax. This machine was a major innovation – the land roller was removed and replaced by two land wheels placed on the outside of the side-frames. A gear inside the land wheel drove the cutting cylinder. This meant that the machine had fewer parts and therefore was much lighter. It also meant a reduction in costs. By 1871 Follows and Bates had sold over 4,000 of these machines. But regular maintenance was required to keep the knives sharp. Thomas Green’s idea was to have a reversible cutting cylinder which could be alternated to produce even wear. Ransomes devised a clever system whereby one of the wooden handle grips would unscrew and placed in a special hole in one of the side gears. The handle could then be used to turn the gear backwards making the cutting cylinder rotate in reverse. By placing flowers of emery on the edge of the knives the cylinder could be ground in. Alternatively, special sharpening tools were devised in which the cutting cylinder was removed from the mower and placed on a machine bed and ground. Ransomes also developed an early machine for just this purpose. Here’s a link to t the old lawn mower club in Britain. A couple of lawnmower patents for rotary lawnmowers. Typical of most technical histories, even of the most seemingly prosaic of technologies you end up with interesting stories with interesting and sometimes strange people. Which is why technical histories are worth exploring.